It seems that you can get almost anything delivered these days. More and more people are ordering goods to be delivered directly from warehouses and manufacturers, both as businesses and as private customers. This is good news for the pallet industry, as these goods need to be handled safely and securely so as to arrive in a good condition. The goods being delivered, however, come in an increasing range of shapes and sizes, not all of which fit neatly into a conventional pallet. Pallets are not always uniform, either – sometimes a pallet will need to be filled with different sizes and shapes of goods instead of several identical items. This means that the freight industry needs to find solutions which will allow oddly shaped packages to be packed, transported and handled with as much security as possible. This is where stretch wrap comes in. 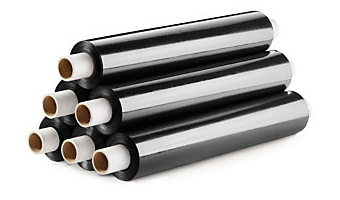 What Is Stretch Film Wrap? Stretch wrap is an elastic stretchable plastic film that can be wrapped around objects of any shape or size. It is often referred to as orbital stretch wrap because it wraps around the entire pallet and the contents – a 360-degree wrap. Because it is highly stretchable, it holds objects tightly and securely in place during handling and transport. It can be used to bundle objects together and to hold single or multiple objects on a pallet – which is why it’s also known as pallet wrap. This means that any shape of package can be held firmly in place. Stretch film wrap is different to shrink wrap, which is applied loosely and then heated to make it shrink. There is no heat involved in stretch-wrapping a product, and the elasticity is greater. Stretch film has some other benefits in addition to its primary purpose of holding packages firmly in place. It offers a certain amount of protection from heat, dust, damp and even from UV light damage. It is light and durable, so it doesn’t add significantly to the weight of the pallet. By keeping the pallet light, you make it easier to handle, reducing the risk of injury to your workforce, and you also keep fuel costs down. As well as keeping your carbon footprint low by not adding to your fuel costs, stretch film wrap can be fully recyclable. Associated Pallets, for example, offers a fully recyclable stretch film wrap which comes in three different colours and six different weights or strengths. These strengths range from 7 to 23 microns, depending on requirements. Different packages will require different strengths and levels of clarity and tar resistance. There are some ways in which you need to be careful when using stretch film wrap. For example, you need to be sure that the goods being delivered can withstand the pressure from the elasticity – fragile objects may need additional packaging or cushioning so as not to be damaged by the wrapping process. Overall, though, stretch film wrapping offers a lightweight, safe and recyclable solution to the problem of shipping oddly shaped objects.